The 400-8403 Double-Center Precision Theodolite meets the requirements of Military Specification ML-474 and is designed to observe and measure angles of elevation and azimuth of pilot balloons and aircraft at any distance up to 20,000 meters under conditions of reasonable visibility. 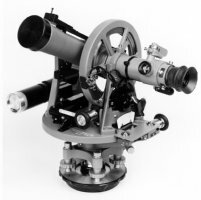 The dual (or bent) axis type telescope combines a 21 power main telescope with a wide-angle 4 power main telescope which is viewed through one horizontal eyepiece for the observer's convenience. The detachable battery case, easily mounted on the instrument, holds two flashlight batteries (D cells) for the 3 volt illumination system. Movement of both the elevation and azimuth scales is by positive micrometer worm drive. Tenths of degrees can be read directly from the graduation on the tangent screw drums. Movement of both elevation and azimuth scales is by positive worm drive, assuring that results are always accurate. This feature has proven successful through many years of service at thousands of installations throughout the world.